Our store Kadife Craft offers an enormous catalogue with cross-stitch and embroideries of many and various kinds. The models are presented and separated in different categories according to type of the embroidery and brand of the embroidery. The collection listed in our shop is about 3500 embroidery and cross-stitch kits and each of the models is presented with as much additional information as possible. Have in mind we constantly add new and interesting details about the cross-stitch kits, about the models and their qualities and properties. But if you are looking for additional information you can send us an e-mail with your question and we will send you mode details about the products. It will be pleasure if we can be useful to you. All the embroidery kits presented in our store are originals with no exception. This means that when you buy a cross-stitch kit you can be sure that we will deliver exactly what the manufacturer of the branded collection has prepared for you. Our clients know that they can count on the originality and that the quality of the kit is guaranteed by the manufacturer himself and no third party has interfered with the kit to spoil it’s originality. The original kits guarantee you that everything in the working process of the embroidery will be in place – the image will become just like the picture you see, the materials will be quality proof and you will have a really pleasurable experience. Sometimes the kits include special materials like special beads, threads, felt and many other that give the embroideries their finished special looks. In the online catalogue of Kadifecraft store you will find some of the most beautiful collections cross-stitch kits in the world. Each of them has its unique style and we are absolutely in love with them. They are beautiful and they are created to give you joy and pleasure. We will try to present these collections of cross-stitch and embroidery kits with some more information and details. Riolis is one of the most impressive collections cross-stitch in the world. The company is relevantly young - it is created in 1996 in Russia. There are three main collections “Create it yourself”, “Riolis Premium” and “Happy Bee”. Apart from these three main collections you will find a number of other enchanting cross-stitch pillows, embroidery bags, pin holders kits and many other beautiful and charming embroidery decorations. The collection "Create it yourself" is very big and numbers hundreds of models. It is very rich in plot and subjects and immensely beautiful. In this collection you will find unique flowers, landscapes, animals and even modern designs and stylized images that are quite original and easy to fall in love with. In this collection you will find two types of thread – cotton stranded thread and woolen-acrylic thread. The cotton threads are Anchor branded and are really of highest quality. They are shiny and a bit fluffier than other threads. In many interviews The Riolis artists share with us that it is important for them to have the chance to show us the different levels of the drawing and how beautiful the embossing structure of the threads makes the embroidery really unique. Especially when the model has both cross-stitch and half stitch in it. This way the drawing becomes very live, dynamic and very elegant. This is why some of the cross-stitch kits are created with a special woolen-acrylic thread that gives an even more embossed drawing surface to the embroidery. These threads are very different from the cotton stranded threads you are used to and when you touch them for the first time you will start to wander why the kit is assembled and created with them. But once you start working with these woolen-acrylic threads you will see the big difference the bigger emboss and the amazing and beautiful effect they give to the cross-stitch embroidery and you will fall in love with them. And we have to admit the colors are amazing as well and create such vivid and pretty combinations when put next to each other that you will love to work with them again and again. These threads are one of the reasons we say that “Create it yourself” is a one of a kind collection with an exquisite interest in the levels of the drawing and the way that colours are combined and sewed – one strand, two strands, cross-stitch or half stitch – and all this in an amazing dance of the drawing. The collection “Create it yourself” includes a series of unforgettable cross-stitch embroideries on black fabric. They are truly unique and are masterpieces in the embroidery world. Our clients share with us that when they embroider them in person they look a great deal even prettier that they look on the photos. They become so pretty. The black fabric is treated and sewed the same way as the other colours of Aida fabrics. With this small difference that it is a bit harder to see the holes where the pin goes in and out because of the black colour of the fabric. There are many ways to make it easier for you. One way is to place some light underneath the fabric and then the holes are quite very well visible. Another practice is to place a white fabric on your knees or on the surface or table you are sitting and again the holes are much better found. It is nice to make things comfortable for yourself while you embroider to make the experience always better. You can read our articles about the ways to make things easy and even more pleasurable when you work over embroidery if you visit our page about embroideries and stitch types. The collection Riolis “Premium” is smaller and in many ways special. It includes models that are truly beautiful and favourite to the cross-stitchers world wide. These models implement Anchor stranded cotton threads and are packed in beautiful gift boxes. These kits are a special way to present respect, love and care for the art of embroidery and cross-stitch and as well a way to show care and love to the cross-stitchers. For not only the embroidery is beautiful, but as well the way it is packed and presented is special. And the cross-stitcher can enjoy working over the kit as all the little and bigger details about the kit are pleasurable and make both the model and the experience of recreating it ever more special and pleasant. This is what the collection Premium is about and the models are perfect for presents for they present a special attention and care for the cross-stitcher who will recicve the kit and enjoy it. 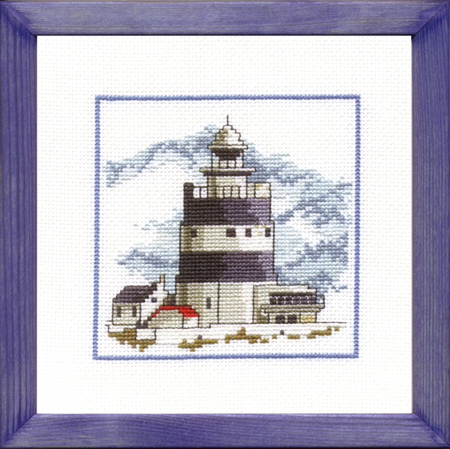 The models are presented in a separate section in our cross-stitch listings. This collection is always adding new amazing modes so check out for them as we constantly add the new ones and always present more information about the kits. This cross-stitch collection includes smaller models that are suitable for the youngest cross-stitchers for the models are very easy and quick to create. Nevertheless experienced cross-stitchers like this collection very much because it is great for relaxation and gives opportunities for adorable gifts to the people we love. Especially to children for the images are sweet, charming and very pretty. It is also preferred as a choce for cirtain holydays decoration for it has some topics like Christmas, winter and Easter included in some of the models. And as well there are series like the butterflies that come in trio and look wonderfull as a decoration together. This collection “Happy Bee” is placed together with the “Create it yourself” collection so you can review both and choose from both together – this gives you a greater variety of size and design topics and shapes to choose from simultaneously and helps you keep all of them in mind while shopping. The collection of Riolis includes other embroideries as well. 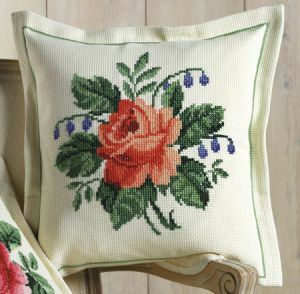 There are some really amazing cushion cross-stitch models you will enjoy very much. They are made usually with woolen-acrulic threads on different types of embroidery fabric to give you the option to choose both the design of the model and its properties as materials and count of the fabric. Sometimes these kits include the finishing back side of the cushion and other decorations as well but some do not include these materials. We have specified in the description of each product in our shop listings what the kit includes and this can give you such information. If there are such additional details we always try to provide them so that you know just what you will have in your cross-stitch or embroidery kit. The collection of Riolis includes as well some beautiful embroidery accessories and decorations with special use. In this collection you will find elegant embroidery bags, pinholders, keeholders and many other interesting shapes and objects. They are situated in the category “Riolis Accsessories and cards” in our on line store. In some of the kits you will find beads, special threads and even felt sheets. The kits include special kinds of embroidery fabric as well and full instructions how to complete the embroideries. The charts are colour and have additional drawings and explenations when needed. The aquarelle design collection of Riolis is famous and indeed beautiful. The designers of Riolis release new models each year and it has become truly impressing. The aquarelle collection of Riolis is created by some of the best artists and embroidery designers in the world. If you can look closer at them you will notice that the drawing is so vividly creted by a masterpiece work between colours and type of stitch – cross-stitch and half stitch. The design is created so that some areas with much intenser colours are cross-stitch and other areas that look a bit transparent are actually half stitch. This gives the embroidery as well various embossed levels and helps light shine different on each of them and this whole miracle combination shows off to become one of the best embroidery collections ever. The cross-stitch looks closer and fluffier and brighter and the half stitch looks further and looks silant and calm. The influence of these designs is truly amazing and they are so much fun to create. It is true that beauty has many shapes and colours and these masterpiece embroideries are some of the best we have seen so far. But it is not only the stitches that give this series its unique looks. The artists have drawn the flowers juisy, heavy and full of scent. They look so pretty because the artist herself is impressed by their beauty and has menaged to recreate the love and admiration with realism but a great romantic mood as well. They are real, they are heave and in the best of the bloom but at the same time very light and vivid. The dark and light zones talk and talk and create a great dynamic in the image almost as if you can see the the bloom opening. We call them Aquarelle because some aquarelle artists draw in such technique. The Riolis cross-stitch kits are presented and arranged in our Shop in three categories – “Riolis cross-stitch kits”, “Riolis cross-stitch Premium collection” and “Riolis cards and accessories”. 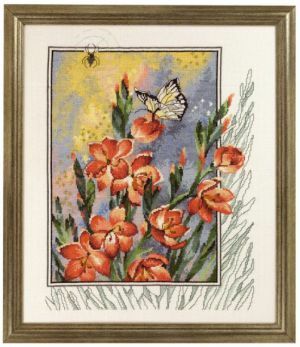 Riolis cross-stitch kits - Here you will find the larger part of the Riolis cross-stitch collection “Create it yourself” and “Happy Bee”. Riolis cross-stitch Premium collection - Here you can find the cross-stitch kits from the speciall Premium collection of Riolis we have presented. Riolis cards and accessories - Here you will find a very big variety of different Riolis models of embroideries and cross-stitch kits like pinholders, handbags, cards and many other. Under each product there is a description of the main characteristics of the model. In the detailed description you will find more information about the artist, the brand Riolis or other aspects of the embroidery kit. Everytime we add a new collection of cross-stitch kits in our website we admire the beauty of the models, the stile and the mood in the drawing and as we now hold in hands the collection of Permin we must admit they are trully amazing. You will find out as you join us and look closer how colorful the drawing is. You will see a great variety of embroideries and not only when we speak of the topics but as well of thypes of embroidery and the shapes and the way they are implemented in our life. You will find cushions, table cloths, wall embroidery, carpets, hardanger embroidery, cards, toys and so many other that you can really enjoy choosing from. The embroidery collection of Permin comes from Copenhagen - a place full of romantic and enchanting views, old buildings, colours, happyness and really great aesthetics. Which will show up in the collection with its mood and point of view. You may know that this is one of the oldest collections of embroideries in Europe as Permin is founded some 160 years ago. It is a resault of many years searching for the right way, the right recepy to create the perfect fabrics for embroideries. It is a long and rewarding search of models as well that will make us enjoy the collection even more as we know this. So we can tell you a lot of things about Permin and we can tell you more about the history of the developement but what is most important is that today we are able to enjoy one of the best collections in the world created with materials of hightes quality epecially for you. And as we speak of this love for embroidery we would like to present some of the main collection traits you can review in our website and enjoy creating. In the collection of Permin you will find some trully beautiful flower embroideries. And it is a collection with it's own style and spirit you will find very atractive once you see it. Some of the models come with an intriguing design as they have an inner embroidery cross-stitch frame separating some of the image as an outline from the other part of the image filled with colours and juisy shapes. This contrast is an original and very beautiful design concept we adore. In the flower collection you will find some models that have gone to being clasics already but you will find ever new and fresh models as well for Permin artists always search for new and atractive designs to offer you. One of the most important and great things about embroideries today is that they are really so vast as to types of stitches, fabrics and thgreads just to give you an ever new and wonderful embroidery experience. So enjoy the flowers of Permin as they come to be a true embroidery pleasure and come in a pure and artistic stile. There are as well smaller models and some of them even come with frames in the kit. The collection of Permin has a number of model sets that are arranged around some topic and come in a a very sweet series of embroideries. Some are three models that correspond to each other, four that go perfectly togeather. There are of cours even longer series of models. So as we mention them they come to be perfect for various places and can become a great part of many interior designs because it apears they are created in such a pure but fasionable fay that can match many designs and can become accents. It is really nice whan you find such series of embroideries because after you enjoy creating them you can use them to compliment the environment and make it realy more comfortable. And it is very nice that some of them are smaller in size and can be sewed very quickly. Actually so many things are so cute about them that you just need to check them out. If you take the sea models you will have the perfect arrangment for sea and lake houses. If you embroider the car and housing ones you can have the perfect suburbian city or smal town mood accents. Especially if you like the views of houses and you want to have them inside as well. You will be really very plesantly surprised by the Permin Cushion collection. The models are very pretty, many of the models are created on various fabrics and that makes them very intriguing because you can actually try different things and you can have various aestethics. And scince the fabrics are of highest quality this all becomes a very pleasurable experience. Some of the collections of cushions are cretaed on the same fabric each model, but here you can have some more to look at. And we have always admired this variety in Permin embroideries. For example the cushion you see on the image here is made on a fabric that is not of the biggest size but still is big enought to be sewed very easily. And is so beautiful and so easy to create that is actually on the half way between the 14 count and the 4.5 count embroideries to make thing just perfect. So check these charmers out as they come in many models and some really nice designs we already have become very fond of. The table-cloth collection of Permin is really huge and has so many models that you can actually find anything you would like. And we are not yet even talking about the hardanger collection of table-cloth because we have given them a separate article. The table cloth collection includes models with a great variety of sizes so you can choose exactly for your interior or exterior needs and furniture as to space and covering size. But as well the models are really numerouse and if you just look at them you will find table-cloths in just about any celebration thematic - easter, flowers, Christmas.. O and when we speak of christmas you will have some pretty ones to choose from. Becasue the Christmass collection of Permin is really rich and beautiful. One of the best in the world we might hapily add. The kits include all the necessary materials and the fabrics are as always branded with the Permin fabric quality. 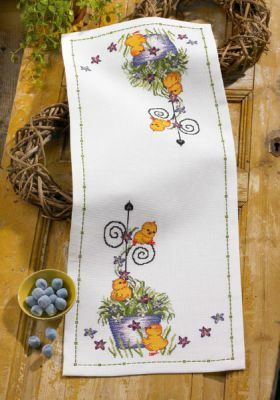 But as you see all these images on the table runners and table cloths have in mind that they are so easy to create. And what is best about them is that on one hand they give you the pleasure of the creation of the embroidery but later when you place them on the table they create for you a beautiful and special experience you can share with your loved ones. And actually enjoy all the way as you create your next interior and celebration decoration. When we speak of originality the hardanger collection of Permin is right in the middle of the topic. Well we admit that with such collection in hand one can always find ways to entertain. And on the image you see just a little part of the available models for they are so numerous. As you can see some models have combinations of stitch types and you have as well a cross-stitch to embroider so that you get this amazing table-cloth models.